Samsung and ASUS have today simultaneously made announcements that directly affect the future of their smartwatch ranges. As we edge ever closer to Apple’s September 7 event, where we expect to see a second-generation Apple Watch, these two companies have taken the initiative to introduce their own new smartwatch hardware. Taking to the stage at IFA in Berlin today, Samsung has introduced the Gear S3 Classic and Frontier – successors to the Gear S2, while ASUS brought its latest ZenWatch 3 to the fans’ attention. The wearable market has really begun to bustle, with technology advancements being made quite quickly, so with two new kids on the block, let’s see what the fuss is all about. Before we move on, allow us to advise you to not hold your breath in anticipation of some major change or evolution for the ZenWatch 3, which seems to take us back to the ZenWatch 2 when you get down to the details of it. The same goes for Gear S3 as well, which while has added some new features, but nothing ground breaking, with same design, albeit bigger than its predecessor. So without further ado, let’s check out the new smartwatches, the features, the colors, and the prices being demanded from potential customers. 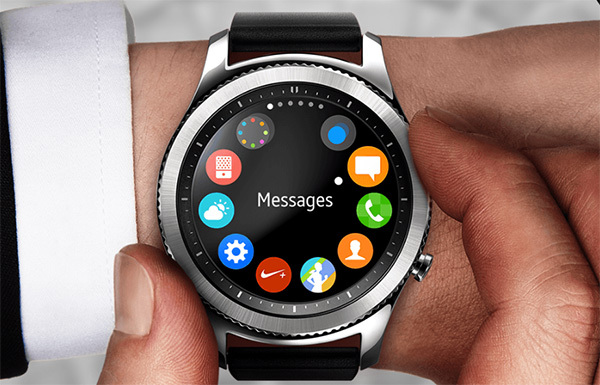 The South Korean company has given smartwatch fans something to look forward to with the announcement of the Gear S3 Frontier and Gear S3 Classic. Very much like what we expect with the announcement of the second-generation Apple Watch, both of these devices are a relatively small forward step for Samsung, meaning that they aren’t exactly wholesale revamps of the Gear S hardware. Like the Gear S2, both devices run the Samsung’s own Tizen operating system, with the Frontier model being the clear premium piece of kit. 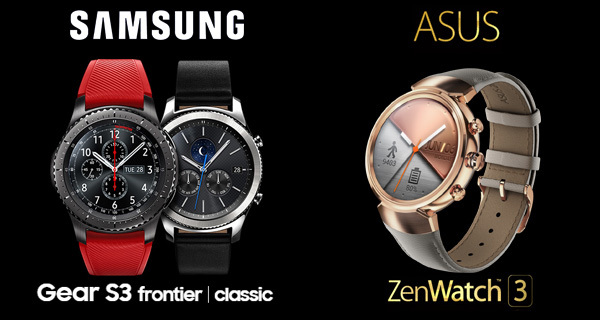 Both the Classic and Frontier come sporting with a 1.3-inch circular display protected by the recently announced Gorilla Glass SR+ for wearable devices, and both offer support for Samsung Pay and a new SOS feature. Interestingly, both the Classic and Frontier pack a built-in GPS, which Apple Watch 2 is also expected to feature. Of course, for those that want to part with a little more money, and therefore receive a little more bang for that buck, the Gear S3 Frontier model is differentiated for them by its LTE capabilities. Both Gear S3 models are adorned with a rotatable bezel which acts as a navigational and selection tool for the Tizen OS interface. Another interesting bit is Samsung taking the personalization route for its latest wearable on the bands/straps front. While the company is officially offering 3 different finishes of straps in 3 different colors, Samsung says the Gear S3 is compatible with standard 22mm bands, which is an industrial standard. If you already own a Gear S2 and are wondering if you should upgrade to the Gear S3, check out the chart below for a detailed comparison of the second and third generation Gear S wearables. Unfortunately, Samsung has not announced prices and availability dates for now, but we’ll let you know as soon as that happens. Till then, check out the launch video of Samsung’s latest wearable. The ZenWatch 3 looks to appeal to the fashion conscious individual looking for an intelligent Android Wear-based wristwatch. The device itself is made of 316L stainless steel, and now sports a circular 1.39-inch AMOLED display coming in at a 400-by-400 pixel resolution. The watch also offers personalization in the form of interchangeable watch straps that allows consumers to customize the experience to their own tastes. Of course there are plenty of stylized watch faces as well that ASUS has made available with the wearable. The ZenWatch 3 offers IP67 water resistance, HyperCharge tech that allows the watch to be charged up to 60-percent in 15 minutes, ensuring that consumers don’t have to wait around for it to spring back to life when fully depleted, and it’s just 9.95mm in thickness. The watch will be available in Gunmetal, Silver, and Rose Gold colors, with prices starting from around the $250 mark. It is expected to arrive in the US and UK and other countries in October. The ZenWatch ad is quite well done.